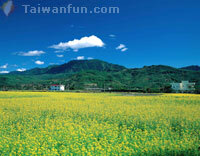 Taitung County lies on the western side of the Central Mountain Range and is divided in the middle by coastal ranges. From east to west, the county lies between the sea and the mountains and is full of scenic coastlines, valleys and plains. Two islands off the coast of Taitung--Green and Lanyu islands--are popular tourists destinations as well. Connected by the South Link Highway, Taitung is easy to navigate, which makes a visit to any of these areas all the more easier. It is no wonder that Taitung, bordered by the sea and stretching from Changbin to Daren Township, is well-known for its shoreline. The coastal mountain ranges of eastern Taitung are the result of millions of years of tectonic activity between the Philippine and Euroasia plates. Eons of erosion in this once-unstable area produced thousands of unusual geological formations, making it a place for hikers and nature-lovers to visit and explore today. Archaeologists believe that humans have lived in this area since the Paleolithic era, nearly 30,000 years ago. From the beginning, people living here have had a close relationship with the land, and local tribes and civilizations once situated along the coast have also left traces behind through artifacts, which are now on display. Besides the ocean, there are also several creeks in the Taitung area. Dawu, Tamali, Jhihben and Mawu creeks all bring a lot of sand and silt to their mouths, creating small beaches and sandy coastal estuaries. These waterways are truly unpredictable and beautiful. The valleys in and around Taitung were caused by earthquakes, erosion and landslides. Long ago, mud and sand poured down the western side of the Central Mountain Range and the eastern side of the coastal range to create vast plains. According to geologists, the western side of the Central Mountain Range is on the Euroasia Plate, while the eastern side of the coastal range is the Philippine Plate. These two plates collided with each other about 10 million years ago, and Taitung's valleys are found where they meet. Although Taitung's valleys do not take up a lot of area, they are fertile and bountiful, providing food and other products for people all over the island. About half of the county's population is somehow involved in the agricultural industry. The mountains provide protection and the fertile plains are nutrient rich, while a low population and rural setting make the fields virtually pollutant free. In winter, the Central Mountain Range blocks northern high-pressure cold air currents, while the warm currents of the Pacific Ocean keep temperatures, in general, higher than west of the mountains. Along foothills on both sides of the valley, serene fields are filled with all sorts of economically valuable farm produce, such as corn, wheat, sweet potatoes, peanuts, soy beans, pineapple, bananas, oranges and pomelos. From north to south, the entire Hualien and Taitung valley area stretches on for 180 kilometers. Two 80-square-kilometer plains, one in Hualien and the other in Taitung, have played an important part in the island's history. 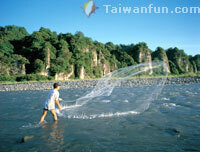 On the southern Taitung Plain, visitors will find Beinan, Taiping, Lijia and Jhihben creeks. Beinan and Amis Aborigines used to farm in this area and the Dutch once mined for gold here as well. The plain was also the site of a war between the Dutch and aboriginal tribes. It wasn't until the 1860s, during the Qing dynasty, that immigrants from Fukien and people from the Pingpu tribe started migrating into this area. Also located near this plain is Liyu Mountain. Although it's only 75 meters tall, you can still get a panoramic view of the entire area. Every year on the 15th and 16th of the first lunar month, the plain sees Taitung's biggest annual cultural event, the Blasting Handan parade during the Taitung Lantern Festival. During this celebration, volunteers dress (or, rather, undress) as Han Dan Ye (寒單爺), the God of Wealth, and walk in a parade wearing little more than shorts, sandals and headgear as they use the branches of a banyan tree to deflect sizzling firecrackers hurled at them. This event, reputedly warding off evil spirits and bringing good fortune, is considered the highlight of the year for local residents and tourists alike. The South Link Highway is the most southern of all cross-island highways in Taiwan. Starting at Fonggang on the western side and heading east takes you up to Daren Township. The entire route is covered by mountain roads, but once you enter Daren Township, the view opens up to the sea and the roads are straight and wide. Besides the Pacific Ocean, motorists can see the southern tip of the Central Mountain Range and Dawushan, where natural preservation areas are located. This is the most scenic part of a drive on the highway and also one of the most beautiful spots in Taitung County. Residents from the Paiwan tribe used to reside in the coastal mountain areas of Taitung and left behind many traditions. Once every five years, a Bamboo Pole Ceremony takes place near here, at Tuban Village on the southern side of Tamali. Of all the Taiwanese aboriginal festivals and ceremonies, this one is a must-see. There are two well-known islands off the coast of Taitung County--Green Island and Lanyu Island. Lanyu, one of the volcanic islands between Taiwan and the Philippines, iss shaped like a tight fist and faces Batanes Island in the Philippines. In the past, Lanyu was named Botel-Tobako, but later was later given its current name because of the beautiful orchids ("lanhua") grown on the island. Lanyu Island used to be the permanent residence of the Yami (Tao) tribe, whose members lived close to the sea. The Kowaan, or Flying Fish Sacrifice, of the Yami tribe is the biggest event of the year for its people. Green Island is closer to Taitung. One-third the size of Lanyu, it is also a volcanic island, although it is inactive today. In the past, a prison here housed political prisoners and death-row inmates. A famous song called "Green Island Sonata" chronicles this place. Though once off limits to the public, the island is now one of the most important tourism sites in Taiwan--even the prison has become a popular tourist destination.